The wide receiver earned the honors with 10 receptions for 141 yards. NFL wide receiver Julian Edelman missed all of last year recovering from an injury. This year, not only did he rejoin his New England Patriots, but the team won Super Bowl LIII and Edelman received MVP honors last night. "I didn't see that coming, really," Edelman, who was still in Atlanta Monday, told "Good Morning America." "I was just so happy we won the game. It's tough football. We had a resilient group out there that just kept hitting at the door and finally it broke when it had to and we were able to sneak away with a win." (Erik S.Lesser/EPA via Shutterstock) Super Bowl LIII MVP New England Patriots wide receiver Julian Edelman holds the Vince Lombardi Trophy after Super Bowl LIII between the New England Patriots and the Los Angeles Rams at Mercedes-Benz Stadium in Atlanta, Feb. 3, 2019. Edelman called the win "awesome" and said he was still "excited" -- but also tired. "My respect level for you is just through the roof," Julian Edelman told her. 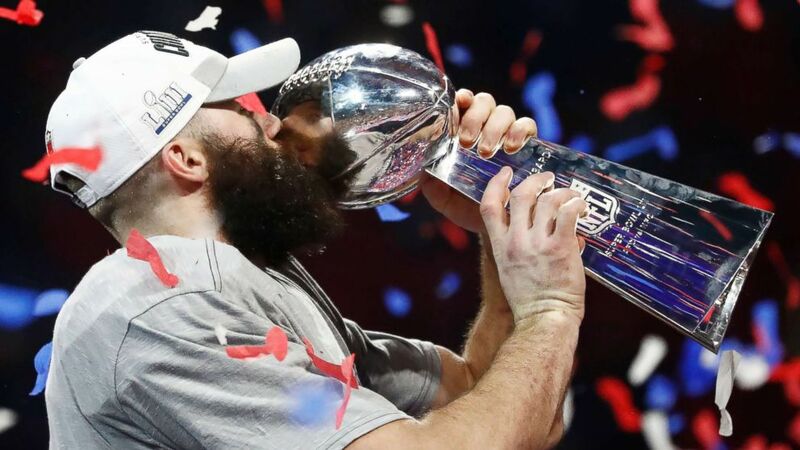 (Larry W. Smith/EPA via Shutterstock) New England Patriots wide receiver and Super Bowl MVP Julian Edelman kisses the Vince Lombardi trophy after the Patriots defeated the Los Angeles Rams in Super Bowl LIII at Mercedes-Benz Stadium in Atlanta, Feb. 3, 2019. "When you play professional football ... you spend more time with these guys in the locker room than you do with your family for 8 months of the year and you know guys in and out," he said. "It's almost like a marriage. This isn't just with me and Tom. This is with multiple guys."